The Vendy Awards come to Corona Park on Sunday. HELL ON WHEELS: Honestly? 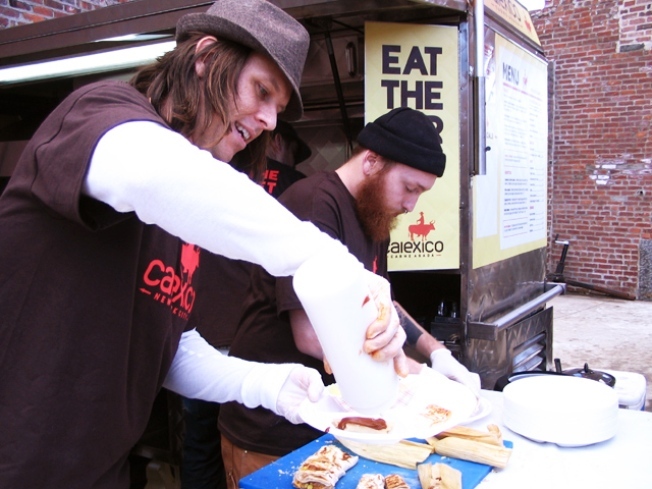 We’re still kind of full from last year’s Vendys, the cook-off awarding top honors to New York City’s best mobile food vendors, where Calexico’s delectable tacos took the trophy. But not so full that we won’t be heading to the Queens Museum of Art this Saturday, as the eat fleet battles it out once more. Tickets ($80 in advance, $100 day-of), may seem steep, but trust us: this is one all-you-can-eat-party that satisfies. 2-7PM; tickets here. THERE WILL BE BLOOD: If you’re already frothing over the October 2 release of the Drew Barrymore/Ellen Page roller derby movie “Whip It,” quell your derby jones at the Saturday night Gotham Girls Roller Derby bout, pitting the Brooklyn Bombshells against the Queens of Pain. It’s the last meetup of the season, and aside from plenty of girl-on-skate action, you can expect “Whip It” giveaways galore. Hunter College Sportsplex; doors at 6:30PM, whistle at 8:30PM; tickets here. TOP HAT: Step back in time – and say sayonara to summer – at the Governor's Island 4th Annual Jazz Age Lawn Party. Michael Arenella's Dreamland Orchestra will provide the swellegant soundtrack, and you won’t want to miss the Parade of Hats, the vintage auto show, BBQ from Cercle Rouge, and the Dorothy Parker Society salon, among many delights. And dress sharp: The Sartorialist is always lurking around somewhere, ready to snap the gorgeously retro attire. Sunday (rain date: Sunday, Oct. 4th), 11AM-6PM. FREEBIE: Forty cultural institutions are throwing open their doors for nary a penny this Saturday, as the Fifth Annual Smithsonian Museum Day turns New York City into a free-art mecca. The Cooper-Hewitt, the Rubin, the New Museum, the Intrepid, you name it: Just print out a good-for-two admission card and pick a destination. Schedule varies by venue; info and downloadable pass here. PLUCKY: We’ve always wondered what “Shook Me All Night Long” or “Part-Time Lover” would sound like if 1930s gypsy guitar virtuoso Django Reinhardt got his hands on it. And that’s the raison d’etre of the Lost Fingers, a cultishly-loved trio from Quebec that runs ’80s songs through a jazz manouche filter -- with often electrifying results. Hear them at Joe’s Pub, Sunday, 7PM; tickets here.